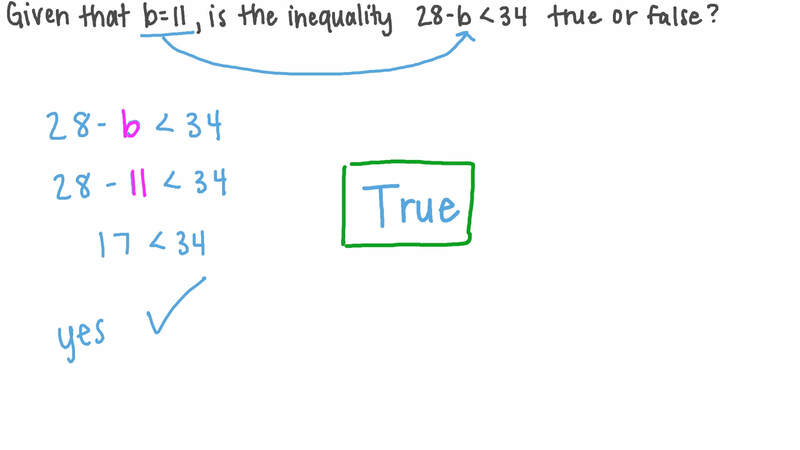 In this lesson, we will learn how to know whether an inequality is true or false for a given value of a variable and to determine numbers that satisfy an inequality. Given that 𝑏 = 1 1 , is the inequality 2 8 − 𝑏 < 3 4 true or false? Is the inequality true or false if 𝑦 = 2 ? 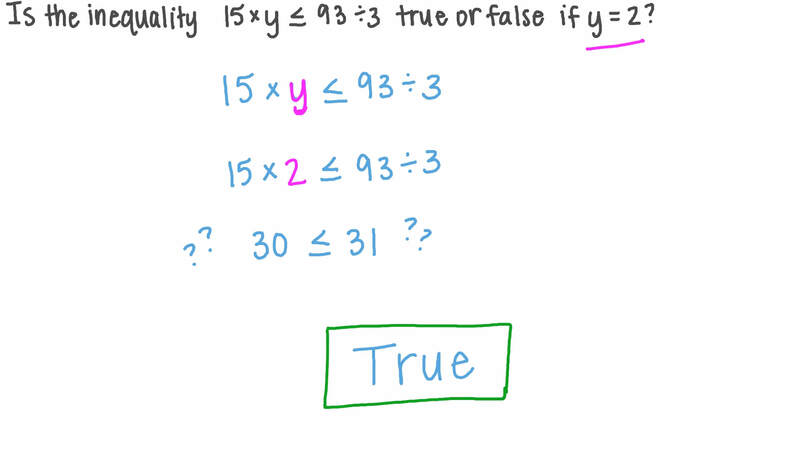 Given that 𝑚 = 5 , is the inequality 4 0 𝑚 ≤ 2 6 true or false? Which of the following values of 𝑥 does NOT satisfy the inequality 𝑥 > − 9 ? Which of the following inequalities does the number − 2 8 satisfy? Choose the largest integer below which satisfies the inequality 𝑥 > 6 . Which of the following inequalities has 𝑥 = 5 1 as a solution? The number 2 is a solution to which one of these inequalities? State whether the following is true or false: If 𝑎 and 𝑏 belong to ℝ and 𝑎 > 𝑏 , where 𝑎 and 𝑏 have the same signs, then 1 𝑎 < 1 𝑏 . Complete the statement: The greatest integer that satisfies the inequality 0 < 𝑥 < 3 is . Which of the following points is not a solution of the inequality − 3 𝑥 − 3 𝑦 ≤ 5 ? Which of the relation symbols below makes the following statement true? The point ( − 3 , 2 ) belongs to the solution set of the inequality 4 𝑥 + 2 𝑦 − 2 . If 𝑎 ≥ 𝑏 and 𝑐 < 0 , which of the following inequalities is true? Which of the following points belongs to the solution set of the inequality − 𝑥 − 9 𝑦 ≤ − 3 ? Which of the following are true given that 0 < 𝑥 < 9 ? If 𝑥 ∈ ℝ + , 𝑦 ∈ ℝ + , and 2 5 𝑥 < 8 1 𝑦 2 2 , which of the following is true? Which of the following inequalities is true? What is the name of the set of all values that satisfy a given equation or inequality? Is the inequality true or false if 𝑥 = 5 ?